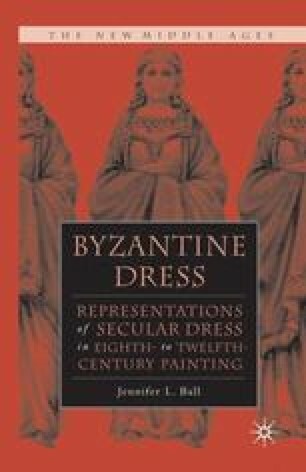 A code of dress can be detected in Byzantine representations, which likely also reflect the real use of dress in Byzantine society. The conscious system of dress that signifies rank and wealth is most obvious in the imperial garments, the loros, tzangia, and crown. While hardly ever worn, these garments were used in images as an iconic representation of the empire itself. Imperial couples asserted themselves as a dynasty, by wearing their unified, non-gendered regalia, and as heirs to the Roman Empire, from where these garments were derived. Courtiers, similarly concerned with the inheritance of Roman administrative and military bureaucracies, which manifested visually in court ceremony, were most concerned with being dressed appropriately, finding their place within the hierarchical system of prescribed dress. The Patriarch Photios in a letter to Boris of Bulgaria advised him that to gain admiration from his subjects, he must be well dressed, surprising coming from a cleric who should have set an example for modesty.1 Here, well dressed implies wearing the business attire fitting for the job of ruler. Certainly, the works of Philotheos and Constantine VII aspired to suitably attired courtiers at all ceremonies.